See more objects with the tag interior, domestic, home, arches, landscape, trees, sidewall, wall, New York, Harlem, toile. This is a Sidewall. It was designed by Sheila Bridges. We acquired it in 2007. Its medium is screen printed on paper. It is a part of the Wallcoverings department. Harlem Toile de Jouy features scenes of young men playing basketball, a couple dancing to a boom box, and people eating fried chicken and watermelon. Toiles are traditionally copper plate printed fabrics popular in the 18th century. They frequently showed pastoral scenes and personifications of the Continents. Toiles did not appear as designs on wallpapers until early 20th century during the Colonial Revival period. There are a number of these early toile papers in the collection. 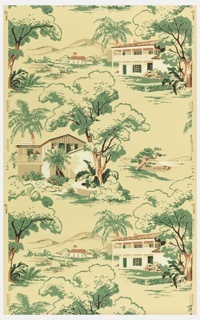 Harlem Toile de Jouy was created by African-American designer Sheila Bridges for Studio Printworks. Bridges, who opened her own interior design business in 1994, received much acclaim for designing the Harlem office of former president Bill Clinton. She was named “America’s Best Interior Designer" in 2001 by CNN and Time magazine. Bridges began hosting her own television show, Sheila Bridges Designer Living, for the Fine Living Network, in 2003. In 2006, she made Essence magazine’s list of the world’s 25 most inspiring women. In addition to interior design, Bridges has expanded into home furnishings design, creating pieces such as Harlem Toile. 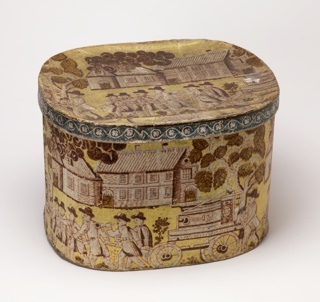 This object was featured in our Object of the Day series in a post titled A New Twist on Toiles.